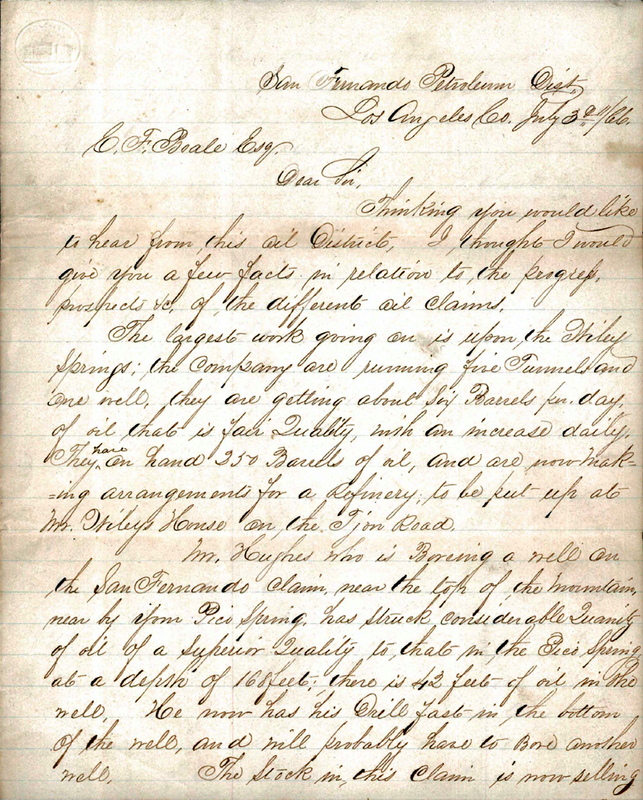 SCVHistory.com | Pico Canyon | Letter from Leaming to Beale, San Fdo. Petroleum Mining Dist., 7-3-1866. 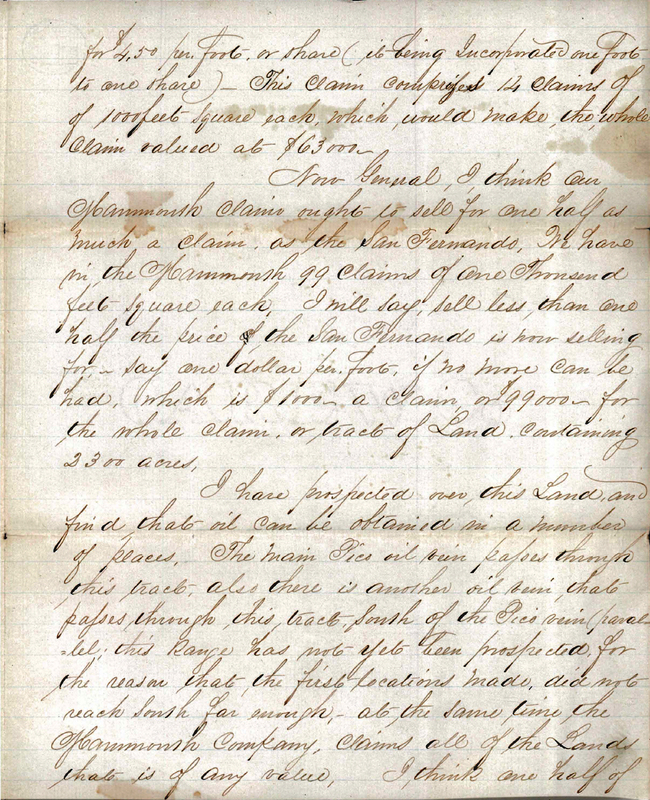 Letter from Christopher Leaming to Edward F. Beale. Thinking you would like to hear from this Oil District, I thought I would give you a few facts in relation to the progress, prospects etc., of the different oil claims. The largest work going on is upon the Wiley Springs; the company are running five tunnels and one well, they are getting about six barrels per day of oil that is fair quality, with an increase daily. They have on hand 250 barrels of oil, and are now making arrangements for a refinery, to be put up at Mr. Wiley’s House on the Tejon Road. Mr. Hughes who is boring a well on the San Fernando claim, near the top of the mountain, near by your Pico Spring, has struck considerable quantity of oil of a superior quality to that in the Pico Spring, at a depth of 168 feet; there is 42 feet of oil in the well. He now has his drill fast in the bottom of the well, and will probably have to bore another well. The stock in this claim is now selling for $4.50 per foot, or share (it being incorporated one foot to one share). This claim comprises 14 claims of 1,000 feet square each, which would make the whole claim valued at $63,000. Now General, I think our Mammoth claim ought to sell for one half as much a claim as the San Fernando. We have in the Mammoth 99 claims of one thousand feet square each. I will say sell less than one half the price the San Fernando is now selling for - say one dollar per foot, if no more can be had, which is $1,000 a claim, or $99,000 for the whole claim or tract of land containing 2,300 acres. I have prospected over this land and find that oil can be obtained in a number of places. The main Pico oil vein passes through this tract. Also there is another oil vein that passes through this tract south of the Pico vein (parallel). This range has not yet been prospected for the reason that the first locations made did not reach south far enough. At the same time, the Mammoth Company claims all of the land that is of any value. I think one half of the Mammoth Tract is as good oil land as the San Fernando claim. If so, according to the present price of the San Fernando stock, the Mammoth ought to sell for $2.25 per foot or $2,500 a claim of 23 acres. 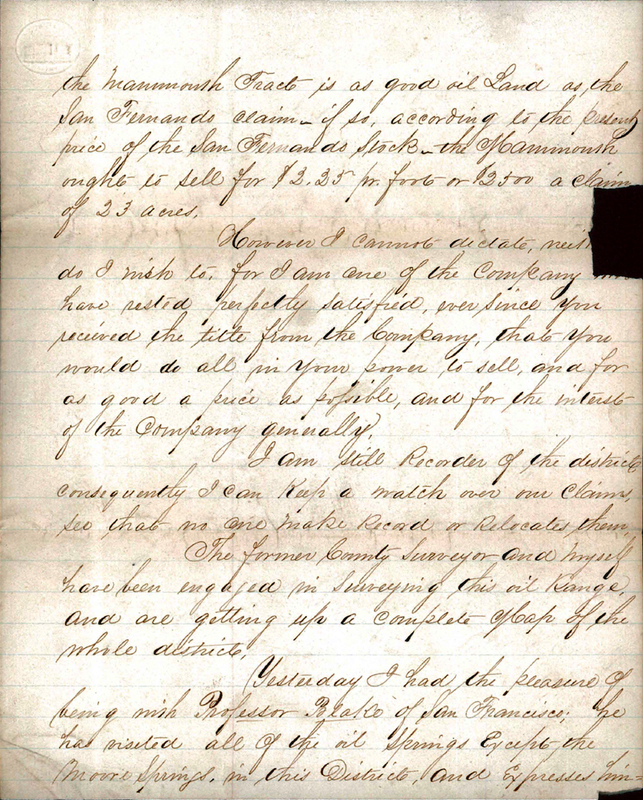 However I cannot dictate, neither do I wish to, for I am one of the Company [who] have rested perfectly satisfied ever since you received the title from the Company, that you would do all in your power to sell, and for as good a price as possible, and for the interest of the Company generally. I am still Recorder of the district; consequently I can keep a watch over our claims so that no one make record or relocates them. The former county surveyor and myself have been engaged in surveying this oil range and are getting up a complete map of the whole district. Yesterday I had the pleasure of being with Professor Blake of San Francisco; he has visited all of the oil springs except the Moore Springs in this district and expresses himself as highly pleased. Also one of the principal refiners of the Philadelphia & California Petroleum Co. (Dr. Peckham) has recently visited this district. He also seems highly pleased. 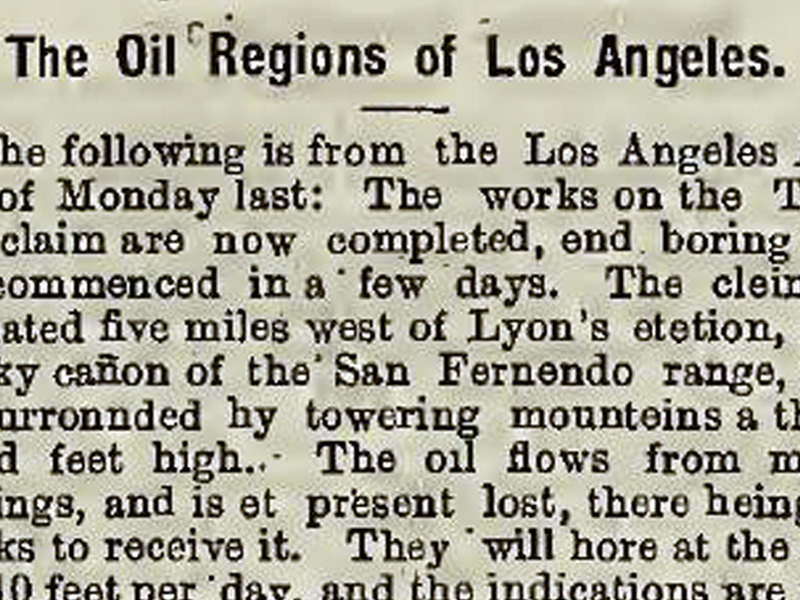 He was at your Pico Spring the last place before leaving and said to Mr. Lyon that he has now seen all of the oil [springs] from Pointe Conception to Brea Cañon below Los [Angeles] and that he valued the San Fernando Dist. more than all the others put together; and that he would not give the Pico spring for all of the celebrated Ojai Ranch above San Buenaventura. General, our district is now beginning to come into notice abroad. There has been so much letter writing against the interests of this district, that it has been little known. We have not filled San Francisco newspapers with fabulous letters relative to the oil in this Dist., but instead we have been prospecting and opening the springs and have produced the oil, which is far better for us than all the letter writing. We want our dist. to come up upon its own merits, which time has now come. I enclose a small map of the Mammoth and the claims adjoining. It may be of service to you. 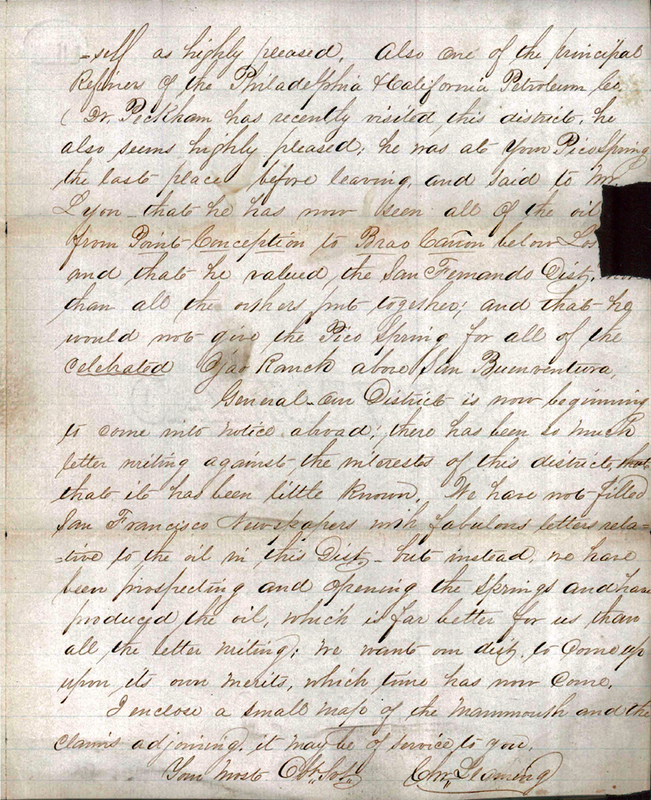 Transcribed by Stan Walker | From the Robert S. Baker Collection at The Huntington Library.